As little as a decade ago, smart homes were the stuff of science fiction. A year ago, vendors at consumer electronics shows could only offer prototypes of most of the technologies they hoped to soon offer homeowners. Less than a month ago, at the Consumer Electronics Show in Las Vegas, home automation specialists showcased genuine, functional products that homeowners across the country are already benefiting from. The smart home is not a new concept. But in terms of being a coveted lifestyle that owners of fully automated homes benefit from all day, every day, we are closer than we have ever been. This post takes the reader on a journey down the long and potholed road toward home automation that has gotten us to the present day, and ventures to peer down the (cross your fingers) smooth highway that lies ahead of us. Ask a baby boomer when television broadcasting began (not when the television was invented), and the answer you will here is most likely to fall somewhere between 1945 and 1955—the same decade in which he or she was born. As it so happens, the debut of broadcast television occurred a full ten years before this range even begins. Why trace the roots of home automation back to TV broadcasting, and not radio broadcasting, home telephony, or even the telegraph? Because the simultaneous transmission of motion picture images to any number of television sets that are tuned into a given channel really had no precursor. Where these other inventions were each revolutionary in their own right, broadcast television is in a class of its own. If you asked a technologically inclined person in 1905 (the year before the first successful radio broadcast occurred) if he thought that individuals with different radios in different locations would be able to tune into the same audio programming at the same time in the future, he probably would have said “yes.” If you asked that person’s similarly technologically informed daughter twenty years later if she thought this case would someday apply to video, she would have said “get outta here!” Motion picture imaging would have to be recorded and then viewed on a screen that was hooked up to the recorded video in order to be viewed. That’s just the way it was. But a few smart minds and the cathode ray tube changed all of that. And the changes have been rolling in en masse ever since. As a result, fewer individuals are likely to consider hypotheses about future technologies as outlandish as our forefathers of centuries past. In 1968, theatergoers marveled at the pulleys, levers, and Ferris wheels incorporated into Caractacus Potts’ magic breakfast machine (not to mention his flying car) in Chitty Chitty Bang Bang. Is it a coincidence that this film premiered shortly before the 1970s, the first personal computing decade? In all likelihood, this film’s debut was a sign that previously unimaginable innovations were on the horizon. In the 1970s, the Palo Alto Research Campus (PARC) was the site of considerable PC-related research and development, including that of the mouse and the Ethernet. The first commercially available microcomputer, the Altair 8080, was created in 1975. In that year, the Sony Betamax video tape recorder was also released. The 12” laser disc, a Philips development that is considered predecessor to the CD and DVD, was introduced on the consumer market in 1978. It was also during this decade that the X10 open industry communication standard, which made possible remote control of appliances and lighting in the home—a technological advance that is vital to present-day home automation systems—was developed. In some ways, the 1970s were the most formative decade to date in terms of paving the way for the smart home that we all hope to comfortably live in someday. Another technology that is essential to home automation, especially the aspect of today’s smart homes that makes it possible for consumers to control appliances and systems in their homes from across town, is the internet. The Advanced Research Projects Agency, the government organization responsible for developing the Internet’s direct precursor, was founded in 1958. After a decade of research, the Arpanet—the first wide-area network, was entrenched in 1969. The first known use of the word internet was by Carl Sunshine in 1974. It was a shorthand term for internetworking, the process of joining together multiple networks to share information. Two decades later, after a handful of network expansions, the internet went commercial. Since 1995, the internet has revolutionized the ways in which humans communicate with one another (and with machines) in ways that the youngest generations take for granted. Will future generations take for granted smart technologies that enable us to adjust the lighting in every room of a home without rising from a LA-Z Boy or receive live video footage of what is happening on the front stoop from anywhere in the world? The time and energy we can save—and the disasters we can avoid—using home automation technology are enhancing millions of lives. We can do things automatically that our grandparents would never have dreamed of doing without having to use both hands. Yet there is still an unidentifiable amount of room left for improvement. Over the coming years, existing technologies will be wired to work cooperatively in ways not yet possible; new technologies will be unveiled; and conveniences we might be able to imagine but not yet experience will be realized. The Future: What’s in Store? So what does the future of automation hold? For starters, smart home technology will become more accessible. 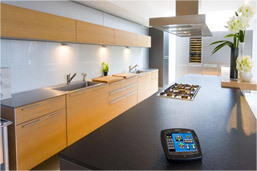 To date, the utilization of most avant-garde home automation technology has been restricted to the upper classes in well-equipped parts of the world. In a decade or two, we can expect to see the middle classes in developing economies checking their smartphones or smart watches to see whether or not they forgot to lock the door, switch the lights off, or turn down the A/C before leaving for work. We will also see integration of already developed smart technologies in ways that just doesn’t exist yet. Today’s critics complain that many automation technologies are not yet compatible with automation control devices or hubs (i.e. smartphones). And, perhaps most excitingly, we will see automated technologies that do not exist yet—refrigerators that alert us when perishable food is approaching expiration, contact lenses that warn us when our blood pressure reaches a level that warrants a visit to the doctor (okay, these are already in the works—but progress must be made before they are commercially available), and perhaps even breakfast machines that will have our eggs and toast ready at a scheduled time to complement the smart coffee machines that have been helping us wake up this way for years. In short, the days in which robots wash our dishes, do our laundry, and scrub our floors for us are not quite here; but they may not be that far away either. In the meantime, we have a lot of nifty time-, money-, and energy-saving gadgets at our disposal that none of our ancestors had before us. The skilled and experienced professionals at Integrated IO® have been helping Phoenicians enjoy them for nearly two years. Most of us are living somewhere in between the age of the Flintstones and that of the Jetsons. To learn more about how Integrated IO®’s home automation services can help you move closer to the age of the Jetsons, peruse our website or call 1 (855) 4-Integrated IO®!